Will Rhodes hugs Glenn Maxwell after Yorkshire's defeat of Leicestershire in the Royal London Cup at Headingley yesterday. Rhodes played a key role, scoring 46 and then taking 2-25 (Picture: Steve Riding). THE Robson brothers like batting at Leeds. Last year, Sam Robson scored his solitary Test century against Sri Lanka at Headingley. Yesterday, Angus Robson, three years his junior, made his career-best one-day innings at the ground too. In both cases, though, it was in a losing cause: Sri Lanka beating England by 100 runs, and Yorkshire defeating Leicestershire by 31 runs, a win that all but mathematically booked their place in the quarter-finals with two games to go. Both Robson brothers were born in Sydney – Angus in the same Darlinghurst suburb as Yorkshire first-team coach Jason Gillespie. Both siblings, too, could be mistaken for the other, solid in defence and compact of method. But when Angus narrowly failed to emulate his brother by reaching a hundred here, falling 10 runs short when he clipped Will Rhodes to Alex Lees at mid-wicket, so the outcome of the match was effectively decided. Leicestershire, chasing 278, had slipped to 166-4 in the 38th over, and the required run-rate had soared above nine. In warm and sometimes sunny conditions, and before a crowd of 4,021, the two innings evolved in similar style. Both sides should have scored more, Yorkshire from a platform of 198-2 in the 36th over and Leicestershire from a foundation of 159-2 in the 35th. Yorkshire got up to 277-9 from their 50 overs, Lees top-scoring with 75 from 110 balls with five fours, while Leicestershire managed 246. Defeat effectively ended the visitors’ interest in the tournament, while Yorkshire can already contemplate the knockout stages ahead of their last two group games against Somerset at Scarborough tomorrow and Northamptonshire at Headingley a fortnight today. With Gary Ballance missing with a tight hamstring, and Liam Plunkett unavailable due to the fourth Test against Australia, Yorkshire showed two changes to the side that beat holders Durham the previous day. Richard Pyrah, the club’s beneficiary this year, made a rare appearance, while 19-year-old Academy all-rounder Matthew Waite played only his second List A match. Six of the Leicestershire side had played fewer than 10 List A fixtures, which highlighted the extent of the challenge they faced. After losing the toss, Yorkshire prevailed fairly comfortably in the end against a club who have nevertheless been a bogey one for them in one-day cricket, having won 16 of the previous 19 completed List A meetings prior to this match, including 10 of the last 11 in Yorkshire. That record never looked likely to be extended as the Yorkshire openers Lees and Andrew Hodd gave their team an excellent start. Hodd, habitually underrated, showed his class with a number of handsome strokes, while Lees has run into form lately after a sticky patch. With a mixture of skill and style, the pair added 80 in 15 overs before Hodd ran himself out after chancing a quick single off Rob Taylor to Ned Eckersley at mid-wicket. Another who has run into form lately is Glenn Maxwell, and he also played some nice shots after receiving a life on two when he was dropped by Michael Burgess at mid-off from the off-spin of Rob Sayer. It was a hard-hit opportunity, evidenced by the fact that the ball flew away from fingers to fence. 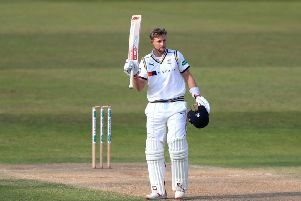 Maxwell was second out at 129 when he skied Sayer to Aadil Ali at long-on before Lees went to his second Royal London fifty in three games from 76 balls with five fours. But Lees’s dismissal triggered the collapse from 198-2, Jack Leaning following for a second-ball duck when he got a leading edge off Taylor to Robson. Yorkshire managed only 56 runs from the final 10 overs. Rhodes was bowled by Ben Raine, having made a one-day best 46 from 51 balls with five fours, while Adil Rashid slapped the same bowler to mid-off. Tim Bresnan holed out to long-on off the former Yorkshire pace bowler Clint McKay, who had Pyrah caught at point and then bowled Steve Patterson to finish with his side’s best figures of 3-47. In reply, Leicestershire started well before Fisher bowled Mark Cosgrove with the score on 49. Leicestershire fell to 87-2 when Maxwell bowled Eckersley, but Robson and Ali added 72 in 15 overs before Ali sliced Rashid to short third-man. After Robson’s removal, Niall O’Brien was bowled by Rhodes; Raine caught at cover off Bresnan; Burgess bowled by Fisher; Sayer caught by wicketkeeper Hodd after skying Bresnan; McKay held on the leg-side off Fisher; and Taylor caught at long-on off Patterson. Fisher’s 3-32 was a one-day career-best, while Rhodes finished with 2-25.